“Swirls & Dots Background” is embossed in gold on turquoise card stock and layered over white background paper that has been stamped with “Fireworks” using a Calypso Kaleidacolor pad. 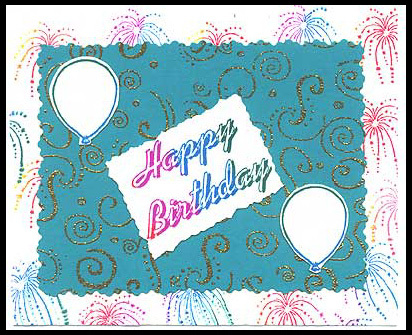 Using the Calypso pad again, “Happy Birthday” is stamped on white card stock, cut out and glued to the “Swirl” & Dots Background”. “Line Drawn Balloon” is stamped with the turquoise section of the Calypso pad, cut out and glued to the “Swirl& Dots Background”, also. Card by Davetta Alexander.